Though it's still raining, we got a bit of sunshine in the mail this week when our order arrived from Superbuzzy. There's nothing like pretty fabrics to cheer a girl up! We're all having serious trouble focusing this week. So as an impetus for us all to get our work done, I promised the girls I would sew up a couple of skirts for them after lessons. I've never seen kids work with so much gusto! I might have to order more fabric for our next rainy spell. I made these from half a yard each, but because of the design layouts, they're different styles. 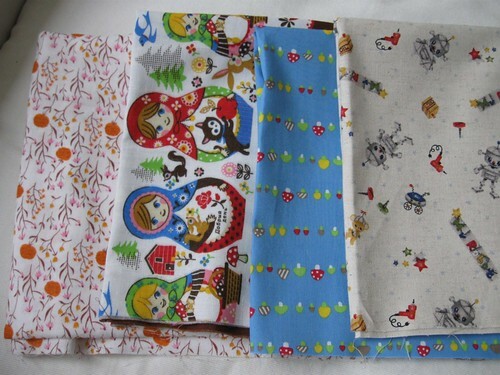 Sunburst helped me pick out the fabrics, and Moonshine was extremely pleased and surprised with her Matryoshka pattern. When Sunburst picked out the mushroom pattern for herself, I had to laugh. After we finished the lower plants, she begged for a break from Botany so we could do more history together. Since that break she has done nothing but talk about plants. I even caught her embroidering fly agaric mushrooms onto a pair of jeans the other day-- and not just mushrooms, but soil and mycelium as well. She is too funny! Preheat over to 350 F. Mix the dry ingredients together. Add in the wet ingredients. Stir until just mixed. 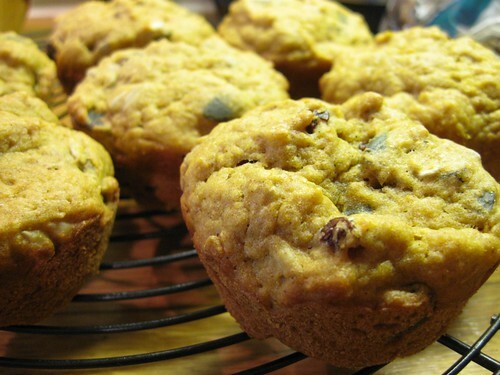 Bake in greased muffin pan for 25-30 minutes or until done. Makes 12. Hello! I have missed so many wonderful posts here! Those pumpkin muffins look so tasty. 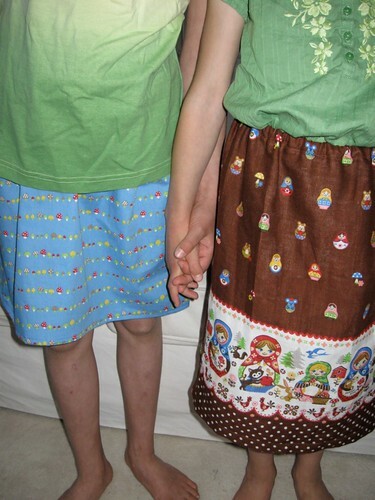 Your girls' skirts are lovely and what interesting fabrics they chose. I hope all that rain ceases up a bit soon. We are slowly finding some sort of rhythm to our learning here but it is slow coming together and it is taking us forever to get through the 4 processes!! Have a happy, hopefully brighter weekend! How cool that you can make up baking recipes! I wing it with certain ingredients but have never tried to create one from the beginning.